I drew a picture for the occasion! Today is the 5th of June, 2015. Precisely one year ago, I was writing my very first blog post and publishing my brand-new blog. And 4,974 views, 79 readers (that’s you! ), 67 blog posts and 1 year later, I’m writing a post, too! 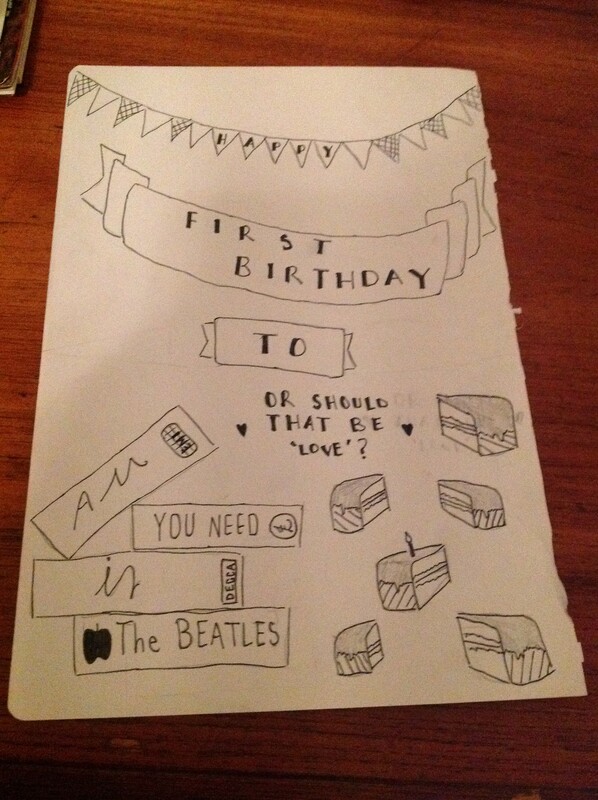 So happy first birthday, All You Need Is The Beatles. To quote John, ‘another year over, and a new one just begun’. AYNITB has come a long way since that very first post. (It was titled ‘Welcome To All You Need Is The Beatles!’, and you can read it here.) In the profile I wrote on myself in my post, I said that John Lennon was my favourite Beatle and that Revolver was my favourite Beatles album. That hasn’t changed. And oh, I still like making really bad Beatles puns. You can see them scattered throughout the blog. But so much has changed in the world of AYNITB, too. You may have noticed that I said something about publishing my poetry and prose on here. Which I don’t do anymore. And now, I write about loads of my other favourite artists, as well. This time last year, I would have barely even heard of a few of the artists that I now know and love. And I hated all modern music, which has changed, too. I started this blog as a place where I could write about The Beatles, and occasionally publish my poetry. It’s sort of turned into a place where I can rant about all my favourite artists, review gigs I’ve been to, write about my own adventures in the world of music and…write about The Beatles! And these past 12 months have been pretty awesome, and I chronicled some great times on here! I wrote about that time I went to my first Beatles tribute, or that time I saw some members of Australian alternative rock royalty perform The White Album in its entirety, or when I finally got my fancy Blu-Ray of A Hard Day’s Night. More recently, I wrote about playing my first gig, and when I met one of my musical heroes, Courtney Barnett! Writing about music is a wonderful thing. Music is something that brings people together; it creates memories. I think it has magical properties. As one of those people who loves music, to be able to write about it is so much fun! Congratulations on one year of writing such a fantastic blog! You really are a great writer. I’m looking forward to many more Beatles (and other subjects) posts to come.